The purpose of the Trinity Parent Organization is to promote a strong sense of community in partnership with the school and to facilitate communication, cooperation, involvement, and service throughout the Trinity School community. All parents and guardians of students of Trinity are members of the TPO. There are no membership dues. 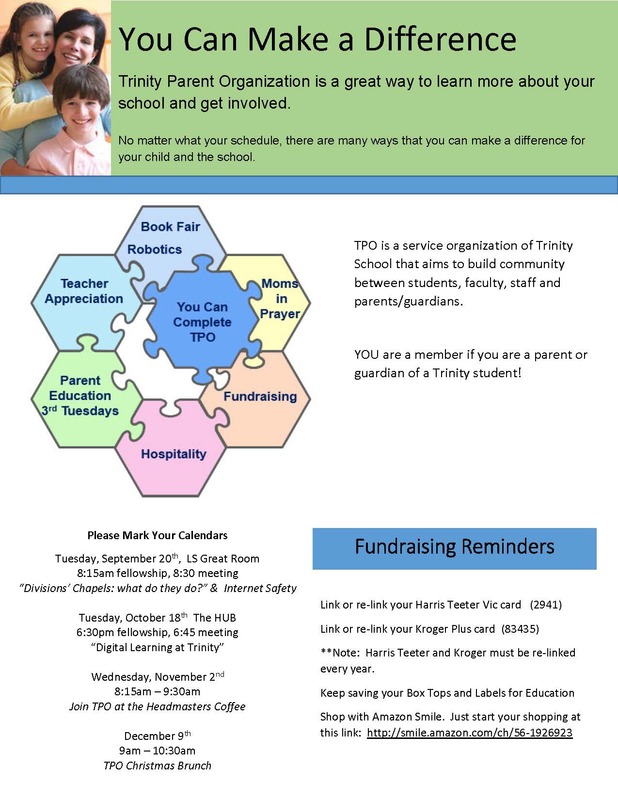 The TPO helps plan various Trinity events, including the Lower School Popsicle Sunday, Homecoming, the annual Book Fair, monthly Headmaster’s Coffees, the annual State of the School meeting, and the Upper School back-to-school lunch. The TPO also sponsors parent education meetings on topics important to the Trinity community. Previous meeting topics have included digital learning, internet safety, social media ins and outs, and a presentation by our seniors on their Capstone projects. The Trinity Parent Organization is a service organization of Trinity School. It exists for the purpose of partnering in the education of students by fostering community-building activities and providing services for students, faculty, and families. The TPO aims to support, strengthen, and enrich the educational partnership across the Trinity community. The TPO has established a number of goals and objectives for its service. These guide the plans and programs of the TPO. To foster a closer connection between home and school by encouraging parent involvement through volunteering, parent education, and service programs. To support and give back to the school money raised as a result of income-generating projects throughout the year. To organize events that support and foster the development of the school's mission. To enable parents to use their God-given gifts and resources (especially time) in all areas of school life to improve the quality of education provided for children at the school. To support faculty and staff in practial ways during the year. To strengthen this partnership by actively supporting the school's communication policy and by regular interaction with the Headmaster and Division Directors. To further develop this partnership by working with the academic staff to sponsor and support opportunities for ongoing parent education. "If you have any encouragement from being united with Christ, if any comfort from his love, if any fellowship with the Spirit, if any tenderness and compassion, then make my joy complete by being like-minded, having the same love, being one in spirit and purpose. Do nothing out of selfish ambition or vain conceit, but in humility consider others better than yourselves. Each of you should look not only to your own interests, but also to the interests of others. Your attitude should be the same as that of Christ Jesus." We have many special events that we could not put on without the help of our parents and friends—your help is invaluable. Thank you for volunteering your time and lending your talents to Trinity School! Please contact Sophie Smith if you would like to volunteer or if you have any questions. Visit the Menchie’s at Patterson Place on Fridays from 1:00 p.m. to close, mention this flyer and Trinity School, and Menchie's will donate 20% of your purchase to Trinity School. Turn your shopping trips into easy cash for Trinity School by looking for the Box Tops logo on hundreds of products in almost every aisle of the store. All you need to do is clip the hot pink box tops and send them labeled with your child's name. Each Box Top is worth $0.10 for Trinity School. Don’t forget our convenient Box Tops/Labels for Education collection mailbox located in the carpool lane. LS parents: Classrooms that collect the most Boxtops in their division will earn a Hot Chocolate Party for the class in December! Earn 5 Bonus Box Tops for our school! Sign up to support our school with Box Tops for Education and earn 5 Bonus Box Tops for our school when you subscribe to the Box Tops email newsletter. Submit your shopping receipts to help earn money and points for Trinity School. See this flyer for more info or visit http://app.shoparoo.com/r/nect8309 to download the free app and get started. Re-link your Harris Teeter VIC card for the Together in Education fundraising program. Linking is easy! Go to www.harristeeter.com, click on "Community," then Together In Education (TIE), or stop by customer service at Harris Teeter to have your card linked to Trinity. Our number is 2941. Link your Kroger rewards card for the Kroger Community Reward® fundraising program, shop at Kroger and swipe your Plus Card. Linking is easy! Click https://www.kroger.com/communityrewards, click on "enroll" and link your card to Trinity School of Durham & Chapel Hill. Our number is 83435. Kroger will pay Trinity a percentage for items purchased quarterly. By saving and redeeming product UPCs and beverage/sauce caps from participating products our school can earn points which we can redeem for VISA Gift cards. If you choose to send in the labels, please make sure the UPC is turned in with the barcode intact. They cannot be submitted if the barcode cannot be read. Located at 1809 N. Fordham Blvd, Chapel Hill, NC 27514, Auto Pro To Call will donate 5% of all receipts from Trinity School supporters on a monthly basis. Just identify yourself as a Trinity supporter upfront, and the service pros will handle the rest! If you need a DRIVING OUR SCHOOLS reward card preloaded with $20, please contact Martha Brown at jackylieq@gmail.com. Recycle cell phones, MP3s, game systems, iPads, tablets and used or unused ink and toner cartridges, etc. Your unwanted items can help raise funds for Trinity. Please check the Green Hippo Website for a complete list of acceptable products. http://www.greenhippo.com/. Drop off donations in the labeled bins next to the reception desks in the Lower School and South Buildings. Questions about fundraising? Contact TPO Fundraising Chair, Martha Brown. Moms in Prayer meets each Tuesday morning, 8:30–9:30 a.m., in the basement of the gym and is open to every Trinity mom. Join us anytime, even if you can't stay for the whole hour. Any prayer requests or questions? Please contact Moms in Prayer. Welcome to the Trinity TPO! My name is Julie Johnson, and it is my joy to serve as President of the Trinity Parent Organization (TPO) for the 2018–2019 school year. My husband Tim and I have four children at Trinity (3rd, 6th, 8th, and 10th grades) and have loved being a part of the Trinity community for the past ten years. The TPO exists, in part, to help foster this community among parents, teachers, and staff. Just as our beloved teachers desire to know and love each student well, the TPO desires to know and love each parent at Trinity well and to help them to plug into the life and activities of the school. Please check out our volunteer sign-up link to find ways in which you might help this year, and join us in participating in the many opportunities and events we have planned. Feel free to contact me at any time with questions, thoughts, or concerns. I can be reached by email at TPO@tsdch.org or on my cell at 919-949-1833. Thank you for your partnership this year!